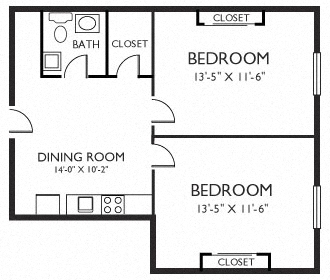 View floor plans for our East Oak Lane apartments. At Academia Suites, we offer the best in space and amenities for studio, one, and two bedroom apartments. 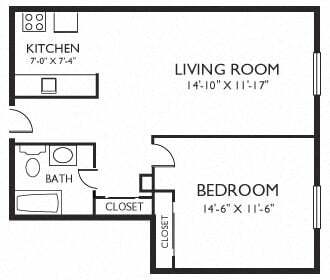 Each apartment has an upgraded kitchen with ceramic floors, a breakfast bar, garbage disposal and a gas range. Our East Oak Lane apartments can be opened with electronic door keys and feature high ceilings with oversized entrance doors and designer carpeting. Select apartments have two sinks in the bathrooms. You’ll love our clubroom, beautifully landscaped grounds, picnic areas and volleyball court. We also offer a 24-hour fitness center so you won’t need to join a gym. Academia Suites is cat and dog friendly so bring Fido and Mittens along to your new home! Call us for a tour of our East Oak Lane apartments today!